Total Body Strength & Conditioning, including bodyweight strength training, sprinting and unloaded running for aerobic endurance. Includes assessments and is scaled to the individual athlete. Best for those focusing on bodyweight training, or those who want to jumpstart their fitness. Don’t be fooled by “bodyweight” – regardless of your incoming fitness, this plan will push you. Version 2 of the plan, updated in June 2017. This 6-week bodyweight training program is designed for both fit, and new athletes who want to focus on bodyweight training or jumpstart their fitness. You’ll train six days a week for six weeks, totaling 36 training sessions. You’ll train Monday through Saturday and take Sundays off. This is a total body strength and conditioning training program. It includes bodyweight strength training for your lower body, upper body and core, as well power training and aerobic endurance. This training program is assessment based. It deploys bodyweight calisthenic and running assessments the first training session of week 1, week 3, and week 6. The follow-on progressions are based upon the athlete’s assessment results. This way the training plan automatically “scales” to the incoming fitness level of the individual athlete. Because it is assessment based, this program is appropriate for both new and possibly unfit athletes, as well as experienced, fit athletes. Everyone will be pushed and will benefit. Further, because it is assessment based, this program can be used in a group fitness setting with a wide variety of athlete fitness levels. GPS Watch with pace and distance. This will just make running intervals easier. During this program, every number of calisthenics repetitions you perform is based on the number of repetitions you completed during your last Assessment in the program (Sessions 1, 13, and 31). This program uses assessments and scaled progressions for your runs, as well. Session 1 has you completing a 1.5 mile run assessment for time. Session 13 has you completing a 3-mile run assessment for time. During the follow-on running sessions, you complete two types of running intervals. First will be shorter intervals at a faster pace than your run assessment. For example, after the 1.5-mile assessment, you’ll run 800m intervals. Second will be longer, but slower, easy runs for time. For example, a 45 minute run at your “easy” pace. The paces you’ll run for both the shorter intervals and the longer easy runs are dictated by your assessment completion time. This way they are “scaled” to the individual athlete. The calculator is self explanatory. Enter your assessment distance, and finish time, and it spits out your interval, and easy run pace. Email coach@mtntactical.com if you have any questions and I’ll lead you through it. Each session should take around 60-75 minutes. Unless indicated, the circuits aren’t “for time.” Work briskly, not frantically, through the sessions. Mobility work is included in the warm ups, and athletes can strength and foam roll after running, however, overall strength and fitness is emphasized with this plan, not mobility/flexibility. Feel free to complete additional stretching on your own. GPS Watch with pace and distance. (1) Max Squats in 60 Sec. (2) Max Hand Release Push Ups in 60 Sec. (3) Max Pull-Up Bar Heel Tap in 60 Sec. (4) Max In-Place Lunges in 90 sec. (5) Max Pull Ups (men), Horizontal Pull Ups (women) in 60 sec. (6) Max EOs in 90 sec. (7) Max Dips (men), Bench Dips (women) in 60 sec. (8) Max Face Down Back Extension in 90 sec. You can stop and rest during the timed events. Just keep working the entire time and get as many reps as possible. Rest as needed between events, but no longer than 3 minutes. Push Ups - go to your knees if necessary. Dips - pause at the top and bottom of every rep.
In-Place Lunge Counting - each foot counts as one rep.
3-mile assessment time into the website Run Interval Calculator to determine today’s run pace. You’ll need Session 1’s exercise max rep totals for today’s training session. “Grind” through parts (1), (2) and (3) - work briskly, but not frantically. Break sets if necessary, but be sure to get all the prescribed reps in. "I just wanted to thank you for your programs. 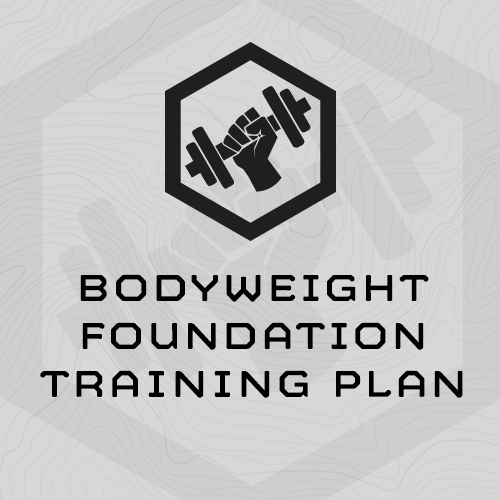 I am currently halfway through the Bodyweight Foundation program. After years of inactivity due to injuries, surgeries, and the mental health struggles that accompany chronic pain, I used to shy away from physical activity in any form. Not anymore. So far I have lost 10 lbs and have toned up. More importantly I feel great and look forward to the next workout. I really like how the program is scaled and based of my max instead of an arbitrary amount of reps. I also like how simple yet effective the exercises are. I plan to complete the program and start it again hoping to transition from sit-ups to pull up bar heel taps. I think that the program will still be effective and challenging even if I cannot transition from one exercise to the other due to the way it’s designed." "Love love love LOVE your Body Weight Foundation so far! Today was Session 14 and I did not think 800s would EVER be that easy for me. Your program is AMAZING and follows the KISS principle of "Keep It Simple Stupid". Thank you SO much for creating these. I'm looking forward to the Body Weight 1 Training Plan when I'm finished with the current. " Wanted to take a minute and thank you for the advice and input. As you suggested, I modified the BWF by replacing pull-ups with bent over rows and adjusted the cardio to mostly walking with mild intervals of jogging for no more than a couple of minutes at a time. He started out only doing 3 rounds of each exercise and is now up to 5. I do everything with him so he is more motivated and doesn’t have to do it alone which is creating some good quality time for us. Bottom line - Using this plan and the suggested meal plan which he easily adapted to…he has dropped 25 pounds already and more importantly is feeling healthier and more confident in his ability to do things.